The present work aims to a further understanding of the generation of ultrasound in Carbon Fibre Reinforced Composites (CFRCs) for their non-destructive testing. A range of three different laser wavelengths has been used for the ultrasonic generation: 10.6µm (TEA CO2), 1.064µm (Nd:YAG) and 308nm (XeCl excimer). The ultrasonic generation mechanism in materials such as CFRCs is determined by the optical absorption depth of the superficial resin layer and the underlying layers of carbon fibres, which is mutually dependent on the material characteristics and laser wavelength. Comparative results of generation efficiency between the three wavelengths used are presented and the role the resin matrix plays is evaluated. Laser based ultrasound (LBU)  is currently attracting worldwide attention as a non destructive testing technique for the rapid inspection of Carbon Fibre Reinforced Composite (CFRC) components used in aerospace. The ultrasound is generated using a high power pulsed laser (usually a TEA CO2 laser) and is usually detected by a Fabry-Perot interferometer [2, 3]. the ablation regime (high energy densities). In the thermoelastic regime, there is no damage to the material. The laser beam is focused on to the surface of the sample, causing it to expand rapidly, in times that are comparable to the rise time of the laser pulse . In metals, the incident laser radiation is absorbed in the thin electromagnetic skin depth, which is of the order of 5-10nm. Thermal diffusion of the material extends the ultrasonic source to a total of ~1µm . In the case of non metallic materials (which is the case of the CFRCs), the whole phenomenon is dominated by the optical absorption depth [4, 7]. The latter can vary from a few microns to several millimetres and is determined by the properties of the material itself and the laser wavelength used. As a consequence, a bigger volume of the material is affected, the temperature rise is less and the amplitude of the longitudinal wave is greater . This condition is referred to as “buried thermoelastic source”. In the ablation regime, the ultrasonic generation mechanism differs greatly . There is plasma formation and the sample is damaged. The ultrasound in this case is due to the recoil force exerted by the ejected matter and the pressure from the expanding plasma . In this regime, stronger longitudinal amplitudes are produced. For the present study, three different types of pulsed lasers were used. A mid-IR emitting TEA CO2 laser (10.6µm), a near-IR emitting Nd:YAG laser (1064nm) and a UV emitting XeCl excimer laser (308nm). a XeCl excimer (Lamda Physik). In order to keep the beam spot size between 0.02-0.03cm2, at all times, a combination of an iris and a focusing lens was used. Filters were used to control the energy for the experiments with the Nd:YAG and the TEA CO2 laser, and a variable beamsplitter for those with the XeCl excimer laser. The composite samples (provided by Rolls Royce) had a thin superficial layer of resin, whose thickness varied between 10-50µm. The mean value of the resin thickness was found to be ~12µm. A cross-section of a crossply sample (orientation of the fibres: 0o/90o) can be seen in the insert to figure 1. For all the present experiments the same unidirectional sample was used (orientation of the fibres: 0o/0o, average thickness ~7mm). Fig 1: Experimental setup: B.F.= beam forming optics (iris and filters/attenuator), L = lens, F.D.= focal distance, S = sample. Insert: Cross section of a crossply sample. A modified Michelson Interferometer  was used to record the absolute epicentral displacements. In order for the Michelson to work, a fairly good surface was requiring the samples to be polished at the back side. A single shot was enough to capture the waveforms and each time the energy was changed, the laser beam was directed to a fresh, non-irradiated spot. After the irradiation, the samples were observed under an optical microscope where pictures were taken and compared with those before irradiation. Pure epoxy resin samples were prepared in order to evaluate the role of the epoxy resin matrix in the composite materials. Araldite LY 5052 epoxy resin (supplied by Ventico) was used to make samples which were cured according to manufacturer’s instructions. To measure the optical penetration depth of the epoxy under the different radiation wavelengths, a sample of approximately 360µm thickness was irradiated by the two IR lasers. The transmitted energy was measured by means of a Coherent power meter as close to the sample as it was possible, in order to avoid scattering. Ultrasonic measurements were carried out on a sample of 16mm thickness. From previous experiments , it was found that a good quality beam was necessary for the accurate determination of the damage threshold. The Nd:YAG laser, was operating in TEM00 mode. The laser pulse duration at FWHM was 10ns. The spot size of the laser beam was approximately 0.02cm2. The rise time of the longitudinal pulse was found to be between 30-40ns. The epicentral waveforms that were recorded above and below the damage threshold are shown in figure 2. The longitudinal wave has been identified in all cases. Fig 2: Nd:YAG: epicentral waveforms. L = longitudinal, S = shear, 3L= longitudinal echo (Waveform (e) has a time offset of 0.1µs to facilitate the reader). Fig 3: Nd:YAG: Longitudinal amplitude vs. mean laser energy. The damage threshold occurs at (6.2mJ, 1.6nm). 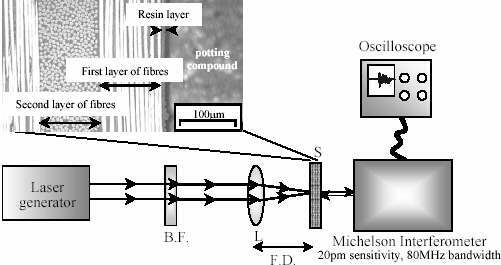 after the experiment, microscopic observation of the first exposed fibres and comparison with images taken before the laser irradiation. The laser pulse duration at FWHM was 50ns –as given by the manufacturer. Figure 4 shows waveforms recorded above and below the damage threshold. The rise time of the longitudinal pulse was found to be around 30-40ns. The damage threshold was identified and shown in figure 5. The spot size of the laser beam was approximately 0.03cm2. Fig 4: TEA CO2: epicentral waveforms. Waveforms (a) and (b) are below the damage threshold. Waveforms (c) and (d) are above. Fig 5: TEA CO2: Longitudinal amplitude vs. mean laser energy. The damage threshold occurs at (37.8mJ, 1.4nm). The XeCl laser had a “top hat” beam profile and the laser pulse duration at FWHM was 20ns. The waveforms recorded are shown in figure 6. The first noticeable thing in these waveforms is the rise time of the longitudinal pulse, which is ~70ns. The spot size of the laser beam was approximately 0.02cm2.The amplitude vs. energy graph is depicted in figure 6 and the ablation threshold has been identified. The characterization “damage threshold” was not used in this case because there was no exposure of fibres up to the laser energies used. Fig 6: XeCl: epicentral waveforms. Fig 7: XeCl: longitudinal amplitude vs. mean laser energy. The ablation threshold occurs at (3.28mJ, 0.17nm). In order to determine the transmission of a characteristic epoxy resin, experiments were carried out using the radiation of the two IR lasers as explained previously at the experimental setup. It was found that the optical absorption depth of the resin was of the order of 100µm at 10.6µm (TEA CO2) and 4mm at 1064nm (Nd:YAG). In both these values there was no correction for the scattering or reflection losses of the laser light. The Araldite sample was irradiated both with TEA CO2 and the Nd:YAG laser. Characteristic waveforms produced with the TEA CO2 laser are shown in figure 8. Because of the very big absorption depth of the epoxy at 1064nm, no significant ultrasound was produced on the sample using the Nd:YAG laser. From the longitudinal echo, it was possible to calculate the longitudinal velocity of the ultrasound in the epoxy resin. It was found to be approximately 2600m/sec whereas the same velocity on the unidirectional composite sample was found to be 3000m/sec. Since the rise time of the longitudinal wave is directly related to the optical absorption depth of the material, it was calculated – using the recorded waveforms- that the latter is approximately 360µm. For the calculation of this value it has not been taken into account the temperature rise in the source region which would reduce the velocity optical absorption depth. Fig 8: TEA CO2: epicentral waveforms on an epoxy resin. While inspecting CFRCs, if the energy density of the incident laser pulse is too high then damage may be caused to the carbon fibre layers, which will result in altering the mechanical properties of the materials. The ultrasonic generation mechanism in CFRCs is a complex function of the optical absorption of the superficial resin and the underlying carbon fibre layers which in itself is a function of the laser wavelength used. In the case of the Nd:YAG laser (1064nm), most of the energy is absorbed in the first layer of carbon fibres  as the resin is almost transparent. At 10.6µm (TEA CO2 laser), both the superficial resin and the carbon fibres absorb strongly [7, 13]. Finally, at 308nm (XeCl laser), the radiation is strongly absorbed by the superficial resin layer . Comparative results from the three wavelengths used are shown in figure 9. In this graph and the tables below, the data from the TEA CO2 laser have been corrected to account for the small difference of spot size. The damage thresholds for the three laser wavelengths can be seen in table 1. From previously presented experiments on a crossply sample using the Nd:YAG laser , there is a difference in the longitudinal amplitude and overall waveform between the old and the present results due to the different anisotropy of the carbon fibres’ lay-up. Fig 9: Comparative results: longitudinal amplitude vs. mean laser energy for all three wavelengths. In the case of the two IR emitting lasers, before the damage threshold, a yellow discoloration of the resin occurred which was a precursor for the oncoming damage. The first microscopic observation of this discoloration was characterized as “discoloration threshold” and the corresponding energy densities can be seen in table 2. It is interesting to note that for the TEA CO2 laser, the discoloration threshold corresponds to a point just after the change of gradient in the amplitude vs. energy graph, from the linear region of the thermoelastic regime to the non-linear region of the ablation regime. No discoloration was observed for the UV emitting laser. Instead, because the ablation threshold is so low, a shallow pit was created whose maximum depth was estimated to reached up to <1µm , at the highest energy densities used. As it has been already mentioned above, no fibres were exposed in this case. Table 1: Comparative results: Damage/Ablation threshold for all three wavelengths. During the irradiation of the samples by the laser, both photothermal and photochemical effects take place. The ones that will dominate in each case is a direct function of the laser wavelength used . For the IR wavelengths, the radiation is absorbed by the vibrational modes of the material, which results in thermal effects (heating, melting, etc.). On the contrary, UV radiation is able to excite and break the intermolecular bonds of polymers (such as the epoxy resin of CFRCs) and result in the photo-dissociation of the material with less thermal effects. According to the results shown both in figure 9 and in table 1, the Nd:YAG laser using 6mJ produced similar amplitude longitudinal waveforms with the TEA CO2 laser using 40mJ. This shows that the Nd:YAG is at least 6 times more energy efficient than the TEA CO2. The latter is the laser, which is currently used in the industry. However, Nd:YAG lasers are now less expensive, portable, very well adapted in many industrial applications and can be tripled or quadrupled in frequency so as to emit in the UV range. In addition, both the 1064nm wavelength and the 308nm can be fibre coupled to facilitate the laser beam delivery and to answer safety problems. In the case of the excimer laser, although the ablation threshold was found to be very low, the damage was localized at the superficial resin layer of the composite sample. Exposure of fibres was never observed, up to the maximum energy densities used. Further experiments using pure epoxy samples are on going. Finally, there is the question of the rise time of the longitudinal pulse. In the case of the IR lasers, this was <40ns but for the UV laser it was significantly slower (~70ns) even for waveforms taken in the thermoelastic regime. This phenomenon has been observed by others in the past  and implies a different ultrasonic generation mechanism with a longer time scale force to which it should be attributed. One possible explanation is the relaxation of the material after its excitation by the UV radiation back to the ground state . Further experiments are underway to investigate the problem. This work is supported by the E.U. (Marie-Curie fellowship HPMF-CT-2000-00999). Taylor G. S., Hutchins D. A., Edwards C. and Palmer S. B., Ultrasonics, 28, pp.343- 349 (1990). Bushell A. C., Edwards C. and Palmer S. B., in Review of Progress in QNDE, Vol.11 eds. D. O. Thompson and D. E. Chimenti, (Plenum Press, 1992), pp. 569-573. Edwards C., Stratoudaki T., Dixon S. and S. B. Palmer, in Review of Progress in QNDE, Vol.20 eds. D. O. Thompson and D. E. Chimenti, (AIP, 2001), pp. 220-227. Stratoudaki, T Edwards C., Dixon S. and S. B. Palmer, in Review of Progress in QNDE, Vol.21 eds. D. O. Thompson and D. E. Chimenti, (AIP, 2002), to be published.